Climate Code Red: Arctic heads for record melt, but do we want to know? The second event was the absence of reporting of this major piece of climate news in the mainstream Australian media, so far as I can ascertain. A similar story was true of major US media outlets. The Arctic is the canary in the climate change mine. The melting poles are our early warning system, and we ignore its messages at our peril. Australia is pouring tens of millions of dollars into coastal adaptation planning. Greenland holds enough ice for an eventual sea-level rise of seven metres, so its fate and acceleration in melt rate should be of great concern. But the community needs to know in order to respond. And the record melt is not limited to Greenland. More than four million square kilometres of floating Arctic sea-ice is also heading for a record low. The University of Illinois satellite data analysis shows it has already dropped in extent to the 2007 record (following image), whilst the US National Snow and Ice Data Centre shows it headed in the same direction. This follows just a week after news that the first purpose-built satellite launched to study the thickness of the Earth's polar caps found Arctic sea ice volume loss to be 50 per cent higher than previously thought. 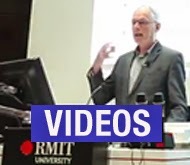 And Prof. Tim Lenton, the world's leading authority on climate tipping points says "The (Arctic) system has passed a tipping point". More worrying, he says, and very likely, is the collapse of the Greenland ice sheet that could cause catastrophic sea-level rise. 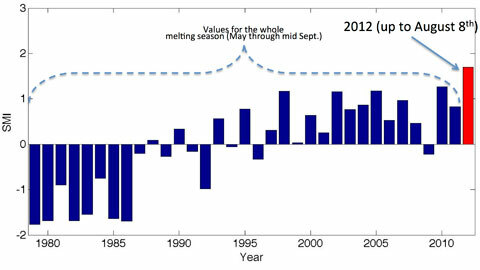 The record Arctic melt in 2007 was big news around the globe, so why not in 2012? Have we become inured to such events, or do we simply no longer want to know? The bi-partisan political orthodoxy in Australia is that to reduce greenhouse emissions by five per cent by 2020 is doing enough. Few voices are prepared to point out that buying international permits means emissions will actually go up, rather than down, by 2020, or that the planned expansion of Australia coal exports will make us a bigger exporter of fossil fuel carbon by 2030 than Saudi Arabia. The gap between science (the necessary scale of action to reclaim a safe climate) and politics (what is politically "possible") is growing alarmingly wide. 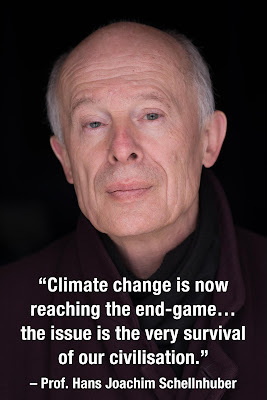 Experts like James Hansen warn that the emissions reduction targets of both major parties in Australia would result in a lot more than two degrees of global warming and are a recipe for global disaster. There is a forlorn hope amongst the political class that two degrees of warming won't be as bad as the science suggests. On recent trends – where observations such as in the Arctic often exceed the scientific projections for rates of change – it’s likely to be worse. 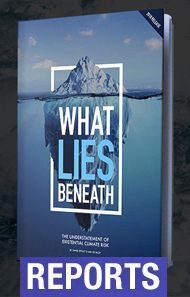 This contradiction between climate politics and scientific imperative is likely to worsen. It is very difficult to bear contradictions without resolving the tension by dropping or denying or denigrating one side of the dilemma. That's how the Nick Minchins of this world survive, while the climate movement campaigns around what is politically “possible”, even while knowing it is totally inadequate. When it all gets too hard, one way out is simply to ignore what is happening in the world of climate change. 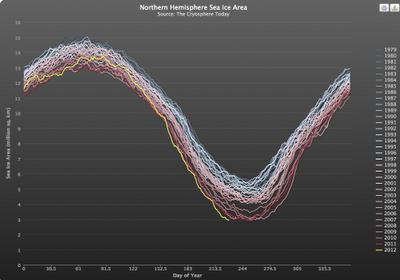 If we don't think about the Arctic's big melt in 2012, perhaps it isn't real.